Looking for Water Slides and Watery Fun? It can get mighty hot in the summer in Colorado. That's when folks flock to the state's outdoor water parks seeking some relief—as well as fun. But racing down water slides is no longer an activity that is exclusive to the summer. With the introduction of indoor water parks, there are now climate-controlled, weatherproof facilities that offer year-round watery fun in the state. 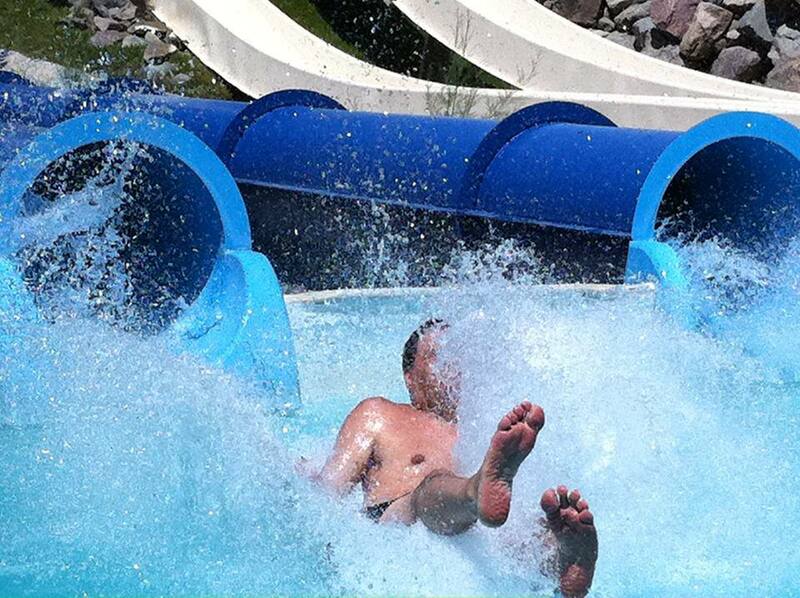 Let's review Colorado's outdoor and indoor water parks, which are arranged alphabetically. The small indoor water park offers 23,000 square feet of attractions, including two 150' slides, an indoor water playground with fountains, dump buckets and slides, a four-lane lap pool, and whirlpools. The center also includes a rock climbing wall, ice rinks, a fitness center, and other activities. Apex Center offers an outdoor splash pad that is open in the warmer months. Included with admission to the Elitch Gardens amusement park, Island Kingdom water park offers a great complement of attractions, including speed slides, the thrilling SlideZilla bowl/half-pipe wave combo ride, a wave pool, lazy river, family raft ride, and a play area for young children. The outdoor park is open during the warmer months. Cabanas are available for rental. Glenwood Hot Springs is not really a water park, although it does include a couple of water slides. The real attraction here is the world's largest hot springs pool. The attraction dates back to 1888. In addition to the pool, Glenwood offers a full-treatment spa that includes mineral hydrotherapy and an inn with 107 rooms. Although it is located outdoors, the naturally heated pool is open year-round. Part of the chain of Great Wolf indoor water park resorts, the park is open to registered guests of the hotel. (Day passes for the general public are not available.) The water park includes more than 50,000 square feet of attractions including a funnel ride, a launch capsule water slide, mat-racing slides, and an interactive water play center with a tipping bucket. Pirates Cove is a relatively small, municipal, outdoor water park with an activity pool, water slides, a lazy river, a spray garden, and a competition pool. Among the park's highlights is a water play structure with a tipping bucket. Splash Water Park is a small, municipal, outdoor water park. Among its attractions are an activity pool, water slides, a spray fountain, a wet sand play area, and a lap pool. It also includes a water play structure with a tipping bucket and the quick-service eatery, Tipper’s Grill. Water World is recognized as one of the country's oldest and best outdoor water parks. It is enormous and loaded with attractions such as a surfing ride, a water coaster, bowl rides, family raft rides, tube slides, body slides, speed slides, a lazy river, a wave pool, an interactive water play structure with tipping bucket, an activity pool, and kiddie play areas. Among its more unique attractions is Lost River of the Pharaohs, a themed lazy river that takes passengers through outdoor and indoor sets much like a dark ride at a theme park. Cabanas and bungalows are available for rental.